Chemotherapy is the most common treatment used to fight mesothelioma. Doctors continue to find newer and more effective chemotherapy drugs to provide relief from this disease. Some of these drugs have even been shown to prolong the life of someone with mesothelioma. Each mesothelioma patient will have their own response to chemotherapy. Some have very little difficulty with the treatment and report that the side effects were minimal. Others will experience greater discomfort and decide that the benefits are not worth the pain. The medical profession has made great strides in reducing the side effects of chemotherapy and mesothelioma patients should talk with their family and their doctor to determine whether to undergo this treatment. Medication and vitamins may be given to help manage the side effects, such as nausea and fatigue. Sometimes, chemotherapy is used prior to, along with, or after surgery. 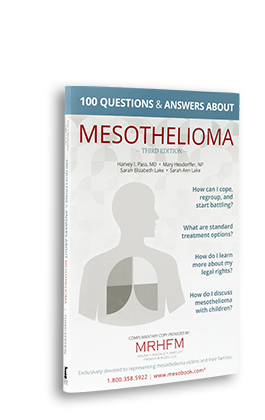 If you or a loved one is interested in learning more about mesothelioma treatment options, complete the form above to request a free mesothelioma book of answers or contact us to speak with a medical specialist who can discuss your options and make a referral to a qualified physician.